Battling over getting your child to read? Help may be at hand! A reluctance to do any reading may be a classic sign of dyslexia, but there may be other tell-tale signs that can raise a parent’s concern according to Joanna Dunton of Bangor University’s Miles Dyslexia Centre. Speaking ahead of Dyslexia Awareness Week, (3- 9 November) Language Therapist Jo Dunton explained that children with dyslexia might be having difficulties with reading, spelling and writing, but also with social skills, and with other seemingly unrelated areas. “It could be that a dyslexic child may be particularly prone to forgetting things or being rather disorganised,” explained Jo Dunton. “Because of the challenges facing them, children with dyslexia may appear withdrawn or lose interest in school work, or might want to avoid going to school and, research has shown, could often be bullied or socially isolated due to their difficulties. These differences can lead to low self-esteem, especially if the child doesn’t understand why they’re having to struggle to do things that other children seem to be able to achieve with ease. Recognising the problem can be extremely helpful - as can setting things in place to help the dyslexic child overcome the particular difficulties facing them. However dyslexia is not all negative, many people with dyslexia have great spatial or 3D awareness, and many go on to be engineers. Places such as the spy HQ GCHQ have dyslexics ranking among their staff as does space agency NASA, so the sky’s the limit! If you think your child may be facing difficulties with reading, writing or any educationally related problem, then the first port of call should be the school” she told the Daily Post. “However, here at the Miles Dyslexia Centre we’re always willing to speak with parents and advise them and can provide consultation sessions for parents and children. Talk to your child - discuss their day or their feelings. 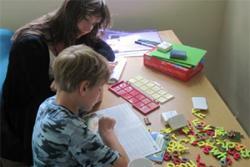 Vocabulary has been shown to have a major impact on developing literacy skills. Look at the whole person rather than focus on your child’s difficulties. Encourage then to get involved with things that they are good at as this will help build self-esteem. Don’t let homework become a battle ground. Little and often is more effective, reading one page or practising one word is better than nothing at all. Spelling practice can be done with a whiteboard or with plastic letters. Try to find a way to make it fun. Reading does not always have to be from a book. Perhaps use sets of word cards to make sentences, play matching or pairs games. Don’t let your child view it as a chore that has to be done. Out shopping- ask your child to read out the shopping list or the signs around the store. We are surrounded by words, use them as resources. Talk to the school about any concerns you may have. Working together with the school can lead to a more coordinated response to any difficulties. Self-organisation can be a key difficulty leading to forgotten books, kit, pens etc. Encourage your child to develop a routine. Is it swimming tomorrow? – Get the kit ready tonight! Encourage the use of memory joggers such as checklists, ‘to do’ lists or school planners. Perhaps a large chalkboard or whiteboard could be used as a family planner. Remember reading and spelling are skills, and, like any skill, they need lots of regular practice. Footballers, swimmers and tennis stars also have to work hard to improve their skills! To find out more about dyslexia or discuss any concerns you may have, the Miles Dyslexia Centre are holding an Open Day between 11.00-2.00 on the 5th November. This is an opportunity for people to drop-in and learn more about the services they offer, or have an informal chat with one of their specialist teachers.